We used a LuxDrive model A011-D-V-700 700mA FlexBlock Constant Current Driver (DigiKey 788-1038-ND, $19.99) to drive the LEDs. The flashlight is powered from 4 9V lithium batteries or from an external 14 to 30VDC power supply (12VDC also works, but may not achieve full power output). Start by constructing the flashlight’s body from an 8″-long piece of standard-wall aluminum or PVC 2” pipe-size (2 3/8” OD) tube. Drill a 3/8” hole 1.5″ from one end for the pot, an a 5/32″ hole for switch another 1.5″ away. We also drilled and tapped a 1/4″-20 hole on the bottom so that the flashlight could be mounted on a standard tripod. Next, lay-out the components next to the body. This will give you a clear indication of the wire lengths that you should use. Start to assemble the electronics by soldering the size M coaxial power jack to the LED output of the LuxDrive model A011-D-V-700 700mA FlexBlock Constant Current Driver. Use a piece of heat shrink tubing to insulate the center connector to prevent shorting. Next, solder the 20 kOhm linear pot to the LuxDrive model A011-D-V-700 700mA FlexBlock Constant Current Driver. Notice the connections such that the turning the pot clockwise will result in an increase in LED intensity. Insulate all connections with heat shrink tubing. Next, connect the switch as shown in the picture. Insulate all connections with heat shrink tubing. Next, extend the black -Vin wire and mount the components in the tube. Pass the red and black power wires through the tube to exit on the back end. Next, assemble the positive power rail circuit. The two positive battery terminals (each for two batteries in series) are each soldered to the cathode of its respective diode (pay attention to the polarity! The battery wire is soldered to the diode side WITHOUT the band). The anodes of the two diodes are then soldered together to a wire from the center pin of the external power input jack and the switch’s wiper contact. Insulate everything very well using heat-shrink tubing. 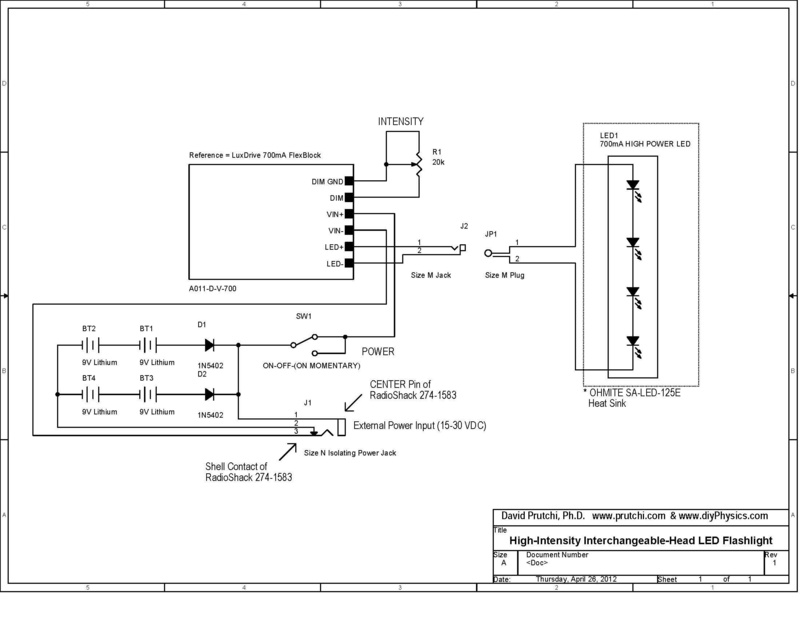 Wire the negative power rail as shown in the schematic diagram. Please pay attention to which pin of the connector goes to the batteries, and which one goes to the negative input of the A011-D-V-700 700mA FlexBlock Constant Current Driver. To complete the assembly of the power unit, use small wire ties to keep wires tidy. Start by drilling eight holes on the aluminum pipe cap as shown in the picture above. The easiest way to mark the position of the holes is to make a photocopy of the heat sink’s bottom and temporarily glue it to the cap. The holes must be just barely larger than the 4-40 stainless-steel screws that you will use to attach the heatsink. Make sure that you use self-tapping stainless-steel machine screws. Next, solder two 22AWG wires to the LED. Pay attention to the polarity! The LED’s mounting PCB is an excellent heat dissipator, so you will need to really heat up the pads to get the solder to melt. Don’t even try mounting the diode to the heatsink before soldering the wires! Pass the wires through two of the heatsink channels, and mount the LED to the heatsink. Use just a tiny bit of heat conductive grease between the LED and the heatsink. 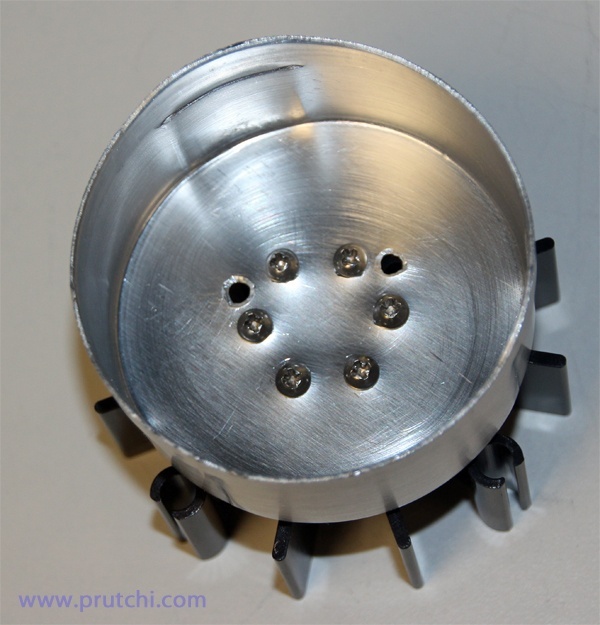 Use 4-40 stainless-steel screws with nylon insulating washers to firmly mount the LED on the heatsink. Clip the wires, place heat-shrink tubing and solder the LED power plug. Lastly, insulate the ends of both connectors (jack and plug) to ensure that they don’t short with the enclosure. If you want a tighter beam from your flashlight, hot-glue one of the reflectors made for these LEDs. Please note that these reflectors are suitable for visible light only. They don’t do all that well with IR, and don’t work at all with UV. It is useful to label the heads because all of the LEDs look similar to each other. That’s it! Enjoy your new high-power flashlight, but be responsible, especially with UV and IR LEDs because the eye’s protection mechanisms do not respond to the invisible wavelengths.